A North West dad paralysed in a head-on car crash posted footage of himself on the internet seemingly driving down the motorway at 140mph. The footage, posted to YouTube by disabled dad Phil Esgate, shows the paraplegic with his son in a 1.8 Seat Leon, driving at double the national limit on a motorway, possibly the M58. Mr Esgate, who can clearly be seen driving the modified vehicle, apparently reaches 141mph at one point, flying past other vehicles. And when apparently tearing along at 130mph, Mr Esgate uses an electronic cigarette, taking one hand off the wheel in the process. A concerned reader contacted the Post terrified Mr Esgate’s behaviour could see someone seriously injured or killed. “This has to be the most dangerous driving I have ever seen,” said the worried mum. “His driving is outrageous and makes me fear for the safety of my family and children out on the roads. 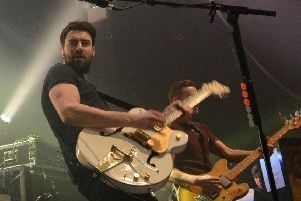 The video, which was published with the caption: “High speed run, paraplegic with hand controls”, has also been criticised by other viewers. But the Standish dad - who lost the use of his legs in a crash - defended his video, saying it is just “clever editing. I have stronger views on people abusing alcohol, and even stronger views on people who drink alcohol and then drive,” he said. “The accident that put me in a wheelchair, paralysed with two ostomy bags, was caused by a drunken woman, who crashed head on into me after leaving a pub, on the wrong side of the road 11 years ago. I campaign against alcohol abuse. “It is just clever video editing using Sony Vegas Pro 15 and a couple of GoPro cameras. I am a vlogger and the video was simply to get attention to my channel, which it has done.